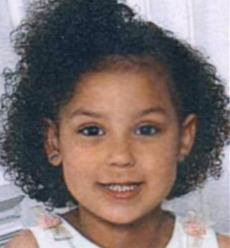 The body of a child was found today buried close to the town where 5-year-old Shaniya Davis disappeared last week has been comfirmed to be that of little Shaniya Davis. Shaniya had been missing for nearly a week, and was last seen in a hotel surveillance video being carried by a man who has been charged with kidnapping in the case. Her "mother", Antoinette Davis, 25, appeared in court today on charges of human trafficking and child prostitution. ...Shaniya was last seen, according to police, on a surveillance camera video at a hotel in Sanford, N.C., in the arms of Mario McNeill, who was arrested Friday and charged with first-degree kidnapping. McNeill is being held on $100,000 bond. Fayetteville Police Department spokewoman Theresa Chance said the child's body was discovered in a wooded area off of Interstate 87 near Sanford, N.C... "We have no positive identification yet," Chance told a news conference, pending FBI results...and positive identification. Police found the body through "information from a credible source and that is what led us to Walker Road," where the child's remains were buried amid a thick tangle of brush, downed branches and trees. Antoinette Davis showed no emotion during her appearance in Fayetteville District Court today.